To keep Hawai`i clean, green, and beautiful by preserving, protecting, and enhancing our environment for future generations. A lei of green encircles each island. Parks, greenways, and bikeways are plentiful. Our streets are lined with appropriate and well-maintained tree plantings. Our residents and visitors fully appreciate our unique scenic environment and act accordingly. Wiring is placed underground and signage is at a minimum. The State of Hawaii is used as a model to demonstrate effective sustainability and recycling. We are the "go to" resource in matters relating to our mission. Hawaii is our home. Because this amazing island environment keeps our families healthy and our souls nourished, we have a duty to protect it for future generations. By planting and protecting trees, we will enhance the quality of life for all of Hawaii's residents. We have a responsibility to future generations to engage in thoughtful planning and principled advocacy now that protects our environment. By working together in our communities, we are responsible to the unique needs of our diverse communities. By working together across our diverse communities, we leverage our collective strength to establish lasting protections for Hawaii's environment and people. We are one Circle. As a 100-year-old organization, we have a kuleana to continue the work of our predecessors. The Outdoor Circle was founded in 1912 and has been Hawai‘i’s leading organization for protecting the beauty of Hawai‘i ever since. 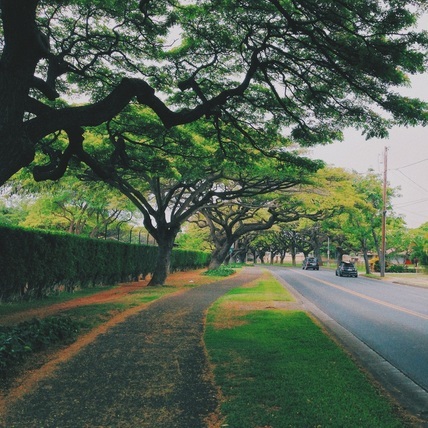 Early Circle members are responsible for the planting of many of O‘ahu’s largest and most recognizable trees. We helped establish many urban green spaces including street trees, public parks, and gardens. The organization is perhaps best known for banning billboards throughout the islands in 1926. Throughout the years, The Circle has expanded its scope to include green space protection, view plane preservation, tree advocacy and many other issues that impact the quality of life for our residents and visitors. The Circle is a grassroots membership organization and is widely known and appreciated throughout the islands as the “go to” organization for keeping Hawai‘i “clean, green and beautiful.” We support branches in every County in the State of Hawai‘i, which work on issues and projects specific to the needs of their local communities. We encourage you to learn more about us and to become a member of one of the most powerful and rewarding organizations in Hawai‘i. Over the last 100 years, The Outdoor Circle has advocated for responsible land use and development, while supporting projects that help to improve the quality of life in Hawai‘i's communities. We are also active in government relations serving on numerous boards and task forces. When needed, The Outdoor Circle is willing to take legal action to protect the scenic environment. Our accomplish this work with funding from a wide variety of sources, especially generous gifts from our members and donors. If you are interested in making a gift to support the work of The Circle, please visit our Donate page by clicking here or call our office at 808-593-0300.